It’s nice to know there still are places in Baguio that have not succumbed to the temptation of over-commercialization and the greed of cutting down all the trees to give way to “development and progress”. 3). SM Baguio (to stop them from cutting trees to build parking lots). Click here for the Awesome Baguio Map bigger version. You can download hi-res file map here. Here is a map to give you an idea of the locations of the different destinations featured in the Awesome Baguio Experience Blog series. There are shortcuts to avoid passing through Session Road. One thing I love about Hotel Elizabeth is that you can still smell the pine trees all around you. …and a living room with a sofa bed and a dining area — perfect for families with kids. It is located on the third floor with a view that directly faces the sunset (see photo above). Bliss Cafe has an eclectic ambiance, a museum of different collections, and memorabilia of the couple. Jim’s wife Shanti is always in the kitchen, preparing delicious vegetarian fare. The menu has a lot of character; it’s like a scrapbook telling the story of Bliss through food. ★ Strawberry Fields Forever (P200). Lettuce, Strawberries, Mint Leaves, Cucumber. We loved the fresh Baguio greens served with strawberries and Bliss Cafe’s healthy yogurt sauce. Soup of the Day (Choice of Salad +P80). We usually order soup because of Raphael. The soup wasn’t bad at all. Leaning Tower (P180). Bliss’ ‘take’ on the classic carbonara with ‘fakin bacon’. The vegetarian versions of popular dishes are interesting. This one had a lot of flavor. I liked the bacon-like ingredient they used here. Grilled Cheese with Veggie Sausage (P180). Warm & Toasty. We found the sandwich a bit simple and safe. We could have ordered the Indian dishes or other more interesting vegetarian fare. ★ ‘No Quack’ Duck (P180 + P25 for Blissmix Rice). Can be prepared adobo or curry style. If you plan to stay in Hotel Elizabeth, reserve the Executive Suite Rooms if you are traveling with a family (there are only 8 rooms on the third floor). Make sure to eat in Bliss Cafe for a healthy vegetarian lunch or dinner. 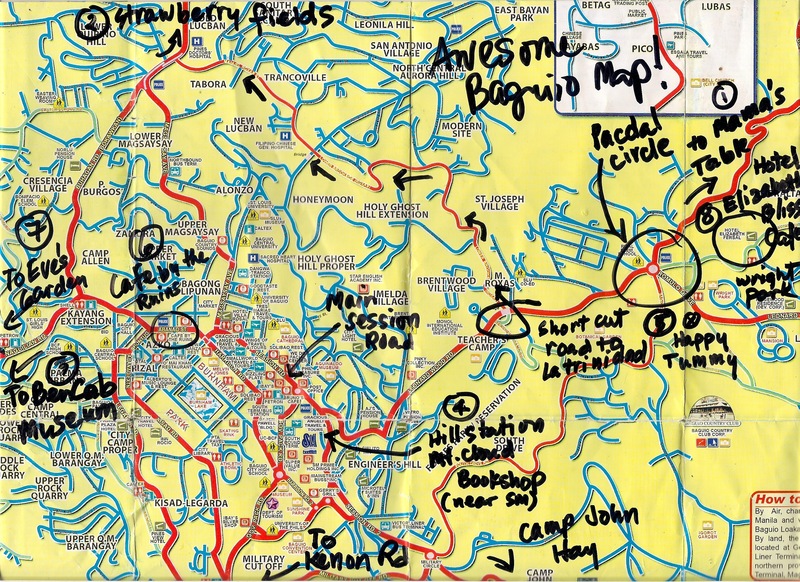 Check out the annotated Awesome Baguio Map to go to the different recommended Baguio destinations. Executive Suite, Fourth Floor FERSAL Bldg. Full Disclosure: Our Baguio Hotel stay was courtesy of our friend Jean Fernando of Trips or Treats, whose family owns the Fersal Hotel Group, which include Hotel Elizabeth in Baguio and Cebu. We paid for our meals @ Bliss Cafe. We are not connected with the establishments and any organization promoting them. Thanks for all the Baguio articles and photos, Anton. I haven’t been to Baguio in years, and this June (is this a good month to go there?) our teachers and staff will have their much-needed vacation there. Though we already have a place to stay, I will definitely recommend the places and gastronomic delights you mentioned here. I agree that SM BAGUIO SHOULD BE AVOIDED AT ALL COSTS. I for one am disgusted that every few blocks in Paranaque there’s an SM establishment. Isn’t there a law against business monopoly, or a zoning law? Again, thanks. We’ll study your map and try our best to visit them all:) God bless! Thanks Milette for the appreciation 🙂 Have fun in Baguio this June! What I love about the place is their tasty entrees for the weary traveler. The strawberry yogurt bowl is looking tasty. Sobrang mahal kasi sa Hotel Elizabeth. May iba ka pa bang suhestiyon na malapit sa Hotel Elizabeth pero mas mababa ang presyo? I looked into Bliss Cafe’s facebook page and it seems that the resto closed last January 2014. Sadly I didn’t have the chance to savour Indian cuisine in Baguio City.